Amazon offers the Little Tikes Jump ‘n Slide Bouncer for $159.99 with free shipping, which is $120 (43%) below retail and the lowest we’ve seen by nearly $10. Instead of renting a bouncy house year after year for your kids’ birthday parties, buy this one while it’s on sale and you’ll save money in the long run. When inflated, it’s about 12 x 9 x 6-ft and can support up to 3 kids. Your purchase includes a storage bag, heavy-duty blower with GFCI plug, repair kit, 4 blower stakes, and 6 bouncer stakes. 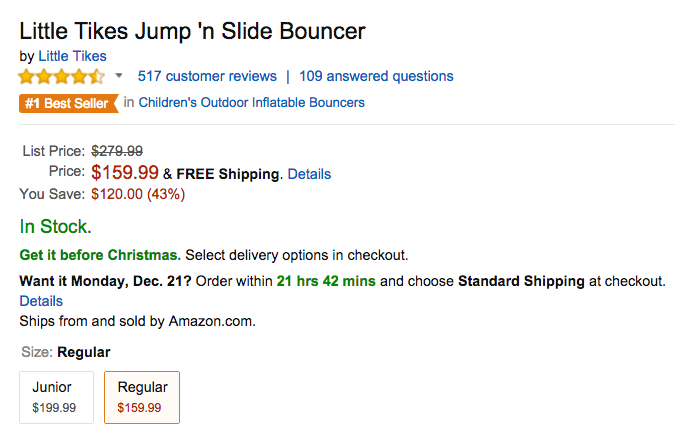 This best-selling bouncy house is rated 4.7 out of 5 stars from 517 Amazon reviewers. All items ship free for Prime members (free trial) or on orders of $35+. Kids can jump, slide and bounce in this Little Tikes Jr. Jump ‘n Slide Bouncer inflatable. A fun, bouncy house design offers a large bounce area and a extra wide slide. The Jr. Jump ’n Slide Bouncer inflates in minutes and folds compactly for easy storage.